Apart from the signal defeat of the Albigensian heretics at the battle of Muret in 1213 which legend has attributed to the recitation of the Rosary by St. Dominic, it is believed that Heaven has on many occasions rewarded the faith of those who had recourse to this devotion in times of special danger. More particularly, the naval victory of Lepanto gained by Don John of Austria over the Turkish fleet on the first Sunday of October in 1571 responded wonderfully to the processions made at Rome on that same day by the members of the Rosary confraternity. St. Pius V thereupon ordered that a commemoration of the Rosary should be made upon that day, and at the request of the Dominican Order Gregory XIII in 1573 allowed this feast to be kept in all churches which possessed an altar dedicated to the Holy Rosary. In 1671 the observance of this festival was extended by Clement X to the whole of Spain, and somewhat later Clement XI after the important victory over the Turks gained by Prince Eugene on 6 August, 1716 (the feast of our Lady of the Snows), at Peterwardein in Hungary, commanded the feast of the Rosary to be celebrated by the universal Church. A set of "proper" lessons in the second nocturn were conceded by Benedict XIII. 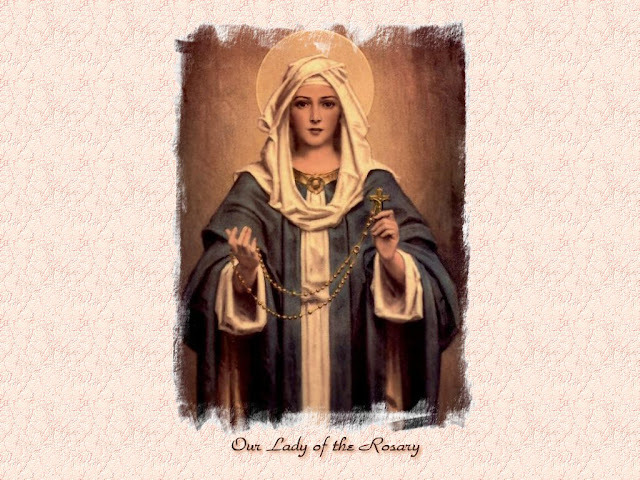 Leo XIII has since raised the feast to the rank of a double of the second class and has added to the Litany of Loreto the invocation "Queen of the Most Holy Rosary". On this feast, in every church in which the Rosary confraternity has been duly erected, a plenary indulgence toties quoties is granted upon certain conditions to all who visit therein the Rosary chapel or statue of Our Lady. This has been called the "Portiuncula" of the Rosary.